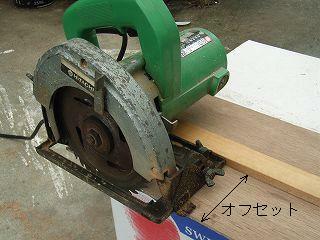 The position of the saw is not understood well, and it bends first because the rule cannot be used if the parallel straight-edge attached to an electric round saw is used. I made the rim saw guide treatment device by using the offset between the application and the rotary blade of the rim saw so that the straight line might cut well with the circular saw. The bee's house is made with an electric round saw. In making the bee's house for the bee from DIY, there is a case to cut the cryptomeria board many times. Moreover, it is necessary to cut it in the same size accurately. It is easy in it to use the rim saw well. However, it is the quite difficult one that cuts the straight line only with the circular saw. It is not possible to cut it in the precise measurement beautifully though it understands if it tries easily only by the parallel straight-edge attached to an electric round saw. This photograph makes the guide treatment device for the rim saw. The above-mentioned two kinds of boards are united at the center with a small wood screw as shown in the photograph. It doesn't care by suitably installing it if there is evenly a board more than the offset in both ends of the batten at the center. Next, the application of the left of the rim saw (left side of the bottom plate) is applied to the application of the guide treatment device for the rim saw made now and plywood is cut. There must be room in beginning cut enough because the destination of the application of the center has gone out of this side of the plywood board by about 10cm. The application of the left of the rim saw hung in the application of the guide treatment device for the rim saw for me by about 70 percent in beginning cut. Please work around here while confirming it with [marunoko] on hand. Please decide the size so that it to be easy use it for myself. The other side is similarly cut when cutting at one of offset positions. It is because the position supported by the hand when the board is cut hits the motor of the rim saw when it is an offset only of one and it is not easy to use it though understood if why the offset was taken on both sides actually uses it. Moreover, it is possible to use it even if one is damaged and it becomes trouble when is in both. The method of cutting the straight line wood with a guide treatment device for the rim saw, draws the line at the board of the tree to be cut by using instigation etc. with the pencil etc.The position that the guide treatment device for the rim saw made in this line this time cuts is applied. At this time, the line cuts and disappears when applying it like seeing the line. In a word, it becomes cutting too much. It has the rim saw guide treatment device at the position in which the line just disappears wanting leave this line completely. If this rim saw guide treatment device is used, using the rim saw becomes happy. It becomes impossible to use the rim saw because it is scary if this is not. It is the one convenient like it. Please make it by all means. It is easy to use it when supporting it by clamping. It goes well when clamping is used, placed, and supported when the one not supported easily by the hand as the big one is cut for a moment is processed. At this time, clamping must use the one that doesn't bulge so much up. Otherwise, the rim saw cannot be passed well. It is easy to use it when the skid sheet is pasted. It is a way easy-to-use when the skid sheet is pasted under the rim saw guide treatment device. I hear cutting well because of no complete gap when the skid sheet (slipping prevention sheet) is used by some accounts ..use.. even if it doesn't support it according to circumstances at all. However, the size removing is noted because the rim saw guide treatment device floats only on the thickness of the sheet.